Ok, choux pastry, you got me. You seem easy to make. When done right, you are delightful. You are light, crispy, buttery and oh so delicate. You are usually filled with a creamy flavoured concoction and if it were up to me, you’d always be drenched in chocolate. French pastry perfection! Why am I waxing lyrical about choux pastry? I was contacted over a month ago by Stitch Craft Create, inquiring whether I’d be interested in a blog hop for author and blogger, Ruth Clemens’ new book, Creative Eclairs, which is being published later this month. Ruth was a finalist on the Great British Bake Off and she blogs at The Pink Whisk. Isn’t the cover of her book beautiful? For more information on the blog hop and to see who else is participating, you can visit both Stitch Craft Create and Ruth’s blog post about it at The Pink Whisk. 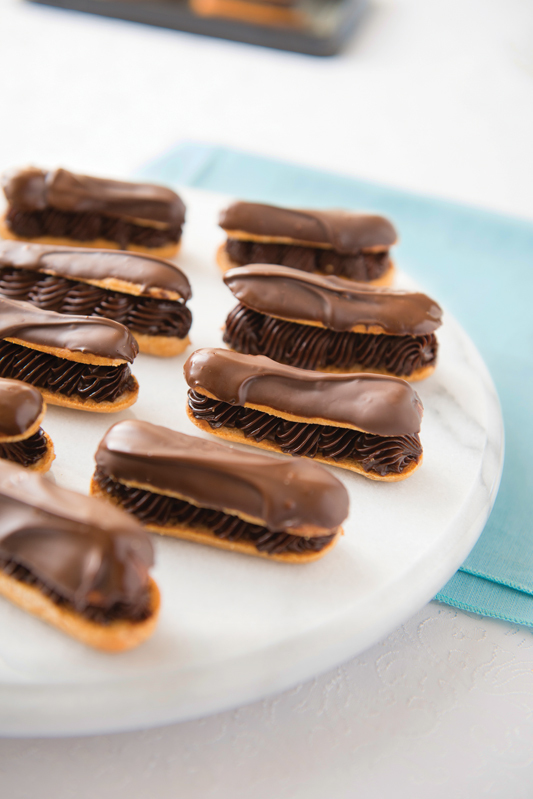 Photo from Creative Eclairs: Bittersweet Minis. 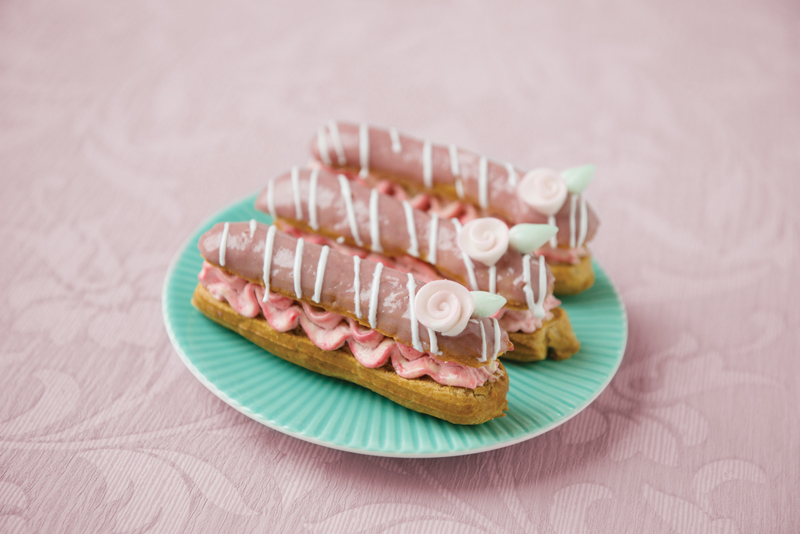 Photo from Creative Eclairs: Raspberry Ripple. 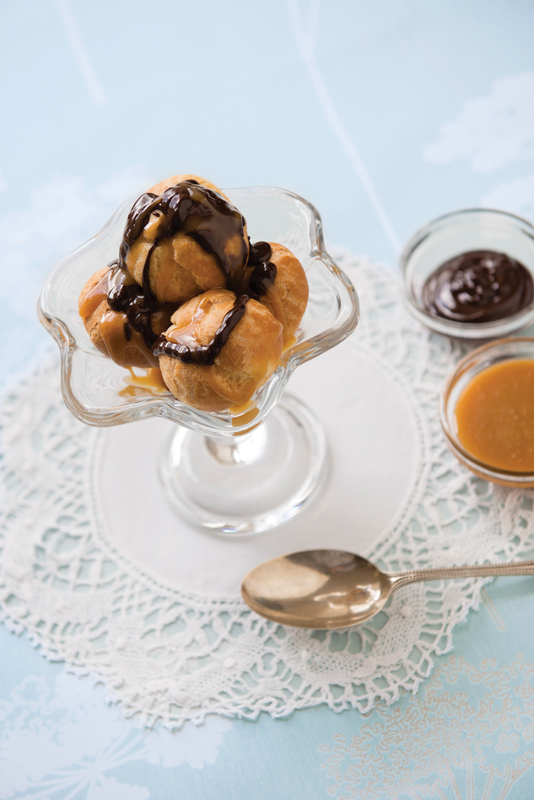 Photo from Creative Eclairs: Salted Caramel Profiteroles. Photo from Creative Eclairs: Croquembouche. 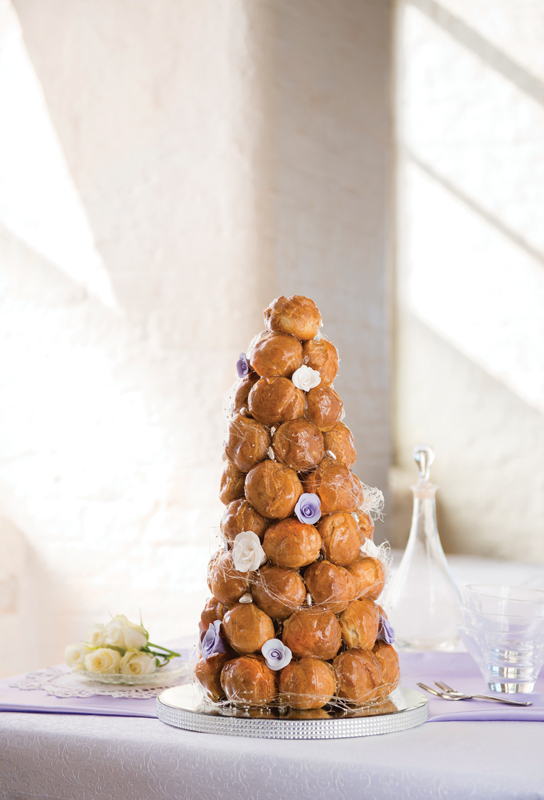 I’ve always wanted to make a croquembouche! They’re so fancy and impressive! And I barely know how to pronounce it, much less spell it, so obviously, it’s uber classy. And you know, dear readers, that I am a classy lady (I know – I barely typed those words out without laughing). Since the choux pastry forms the foundation of the book, I’m not going to be sharing the recipe with you (but one lucky reader will get a chance to try it out!). I will say this. The ingredients are simple. You very likely already have everything you need in your kitchen. The steps are simple too and easy to follow. This was my very first time making choux pastry and I just didn’t count on it to be so…finicky. And this is no fault of the book. It’s human error, fo’ sho’. I think my pastry was a bit too wet and when I piped it, I piped out too much at once. The pastry cream in my piping bag. This yielded wide, flat éclairs that didn’t puff up. No biggie. I filled them with a delicious pastry cream and covered them in chocolate. That fixes everything. Ok, I didn’t exactly use pastry cream. I made a cheaters version. Make the pudding according to the box directions. Easy as pie, people: whip the pudding mix and 2 cups milk for about two minutes. Scrape into a bowl and palce in the fridge while you make the whipped cream. Place 1 cup cold whipping cream into the bowl of your stand mixer with 1 tbsp icing sugar. Whip until you get medium firm peaks. Fold the whpping cream into the pudding. Heavenly. For the chocolate glaze, I melted 6 ounces of rich milk chocolate and stirred in 2 tbsp of coconut oil to give it a beautiful, glossy shine. These aren’t the most beautiful éclairs (they look like long john donuts!) but damn, did they ever taste good. Even my in-laws and the Husband loved these and they are NOT dessert people (how did I end up in this family?!?!?!?). I am determined to make beautiful, perfect, puffed up profiteroles and éclairs. This just means I’ll be re-doing this recipe again and again until I get it right! For an excellent blog post on how to make choux pastry, check out my friend Allie’s detailed post over at Baking a Moment. The girl has mad skills! If you want to purchase a copy of Ruth’s book, you can do so by clicking here. I have one copy of Creative Eclairs to give away, worth £14.99. This giveaway is open worldwide. I am running this giveaway on behalf of FW Media, who will be responsible for sending the book to you by post. There is no cash alternative to the prize nor is the prize transferable. Entry is simple: leave me a comment below and tell me what flavour of pastry filling is your favourite. Giveaway closes at 11:59 pacific standard time on April 9, 2014. I will notify the winner by email. Good luck, everyone, with both the contest and choux-pastry-making! Disclosure: I received a free PDF copy of Creative Eclairs. I was not compensated monetarily for this post. All opinions and comments are my own. Kelly, I REALLY need to take your advice to heart and keep it in mind. I’m always making stupid self-deprecating jokes. It’s like my armour, my thing. I need to be kinder. Especially since these were delicious and they disappeared in no time so I should be proud of what I did accomplish. Thanks for being such a great friend! Why did you almost laugh when you declared yourself to be classy? Of course you are! I also must agree with Kelly above me that you shouldn’t be so hard on yourself. After all, I’ve spent a lot of time on my website displaying my faulty food and then going back and fixing it. The fact that you even attempted choux pastry should be commended and automatically makes you better than me. Awww, thanks DB. Like I just said to Kelly, I really do need to take her advice to heart. I’m always very hard on myself and my fall back is always to use humour, even at my own expense. Thanks so much for the encouraging comments! You get to be classy because you used like 12 words in this post that I don’t even KNOW. ps your drizzling skills are impressive indeed. Hey! Where did the last one in the fridge go? I was getting all excited to eat it for breakfast!! Oh Nance…flat and all, they still look gloriously delicious. I love love love cream puffs. This book may convince to finally try making some. My perfect concoction would probably be filled with coffee cream and drenched in dark chocolate. Great, now I’m drooling. Thanks for the cheater pastry cream recipe. Can’t wait to try it. I insist you take back all of your criticism because your eclairs look just as gorgeous and mouthwatering as the others from the book! There is something about pastry that is just so irresistible – both to make and to eat. Working with this book sounds like a lot of fun! Wow – how decadent are those eclairs. Beautiful photos. I like whipped cream filling! Filings to me are like ice cream flavors – kinda whacky, classic, and delicious! I’m all for a salted caramel filling or better yet – Nutella caramel swirl. Not sure exactly how that can be done, but if someone can do it, I am forever happy! They look delicious! My 5 year old said “Eclairs!! They look so beautiful!” Now I’ve got to make that next! I’d probably fill them with a chocolate-cointreau or salted caramel cream filling. Cheers! I am so dying to try your recipe because I trust you! Definitely! My Favouite filling is coffee. Your eclairs look delicious. I tried to make profiteroles once before and the same thing happened to mine. They just ended up flat. I still ate them though. So fancy!! Love them, can definitely taste it without actually doing so. Eclairs are one of the best French desserts 🙂 Saving this recipe! Thank you!! How can someone not be a dessert person? That is crazy! 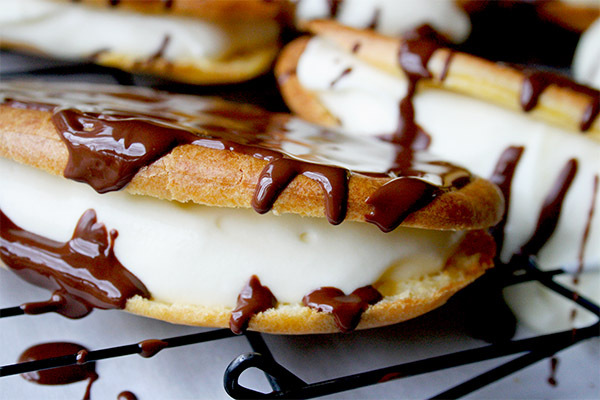 hah Now these eclairs… YUM! I agree.. they should always be drenched in melted chocolate 🙂 And I think you’re being way too hard on yourself.. these look beautiful! They would not last long sitting in front of me that’s for sure. 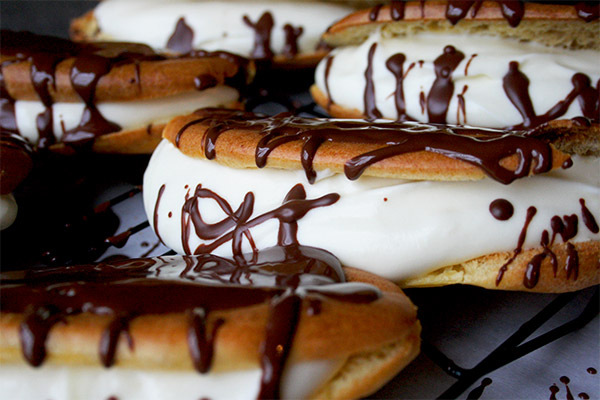 Your pictures are beautiful and these eclairs look so tasty! In fact, I’m pinning them now so I can make them soon – especially that cheater’s cream filler! Nancy, dude these eclairs look great!!! I think they look freaking delicious and so good on your first attempt! and hey, I will take a cheater recipe any day!!! I should totally try Allie’s choux pastry, but I’m scared. . maybe I’ll muster up the courage in a year or so! 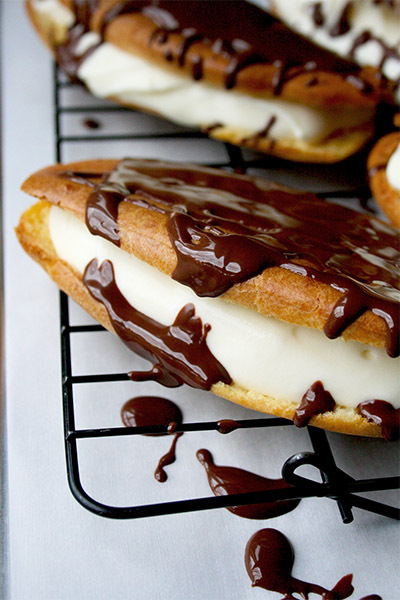 😛 And I would love to win Creative Eclairs! I love chocolate cream filling! I love classic vanilla filling! Coffee cream is my favorite pastry cream filling…I would soooo love to win the Creative Eclairs book, Nancy. BTW I’m going on a Pinteresting frenzy after I finish my comments. 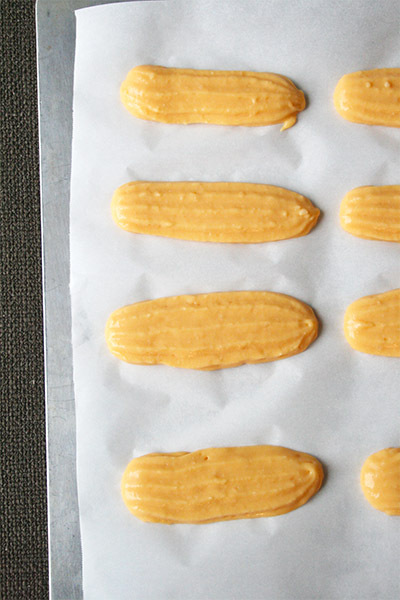 And, P.s., Your eclairs look beautiful and delicious! LOVE this! I need to get into making more elaborate pastries like this! 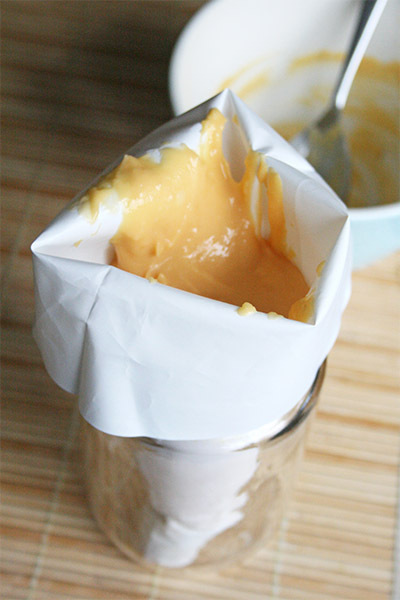 I totally love your “cheat” pastry cream (nobody got time for whipping all those egg yolks!). I might try to make these for my English class! Hi Erica, thanks so much for your sweet comments! Re: the cheater’s pastry cream. Warning: it’s pretty runny, which makes for some messy but delicious eating. I just wanted to reiterate that fact before you got pastry cream all over the desks in your English class, lol. Omgosh. I am in LOVE WITH THIS! So beautiful and looks so YUMMY! I want it for breakfast-now! I LOVE choux pastry. I love making it, I love eating it, I love how it reminds me of my Grandma and her special cream puffs. I love how it reminds me of culinary school and listening to 18-year-olds giggle about the word “Paris Brest.” But yes, it’s totally finnicky. I made savory cheese puffs with it last time, except errr….I forgot the water. The liquid was supposed to be half water, half milk. I totally left out the water, and those puffs…did not puff. So maybe it’s not so much finnicky as it doesn’t tolerate user error at all. P.S. My Grandma always filled her cream puffs with Cheater’s Pastry Cream. She didn’t call it that. But it was pudding and whipped cream, and delicious! Hi Nancy. This is the most delicious post by far. 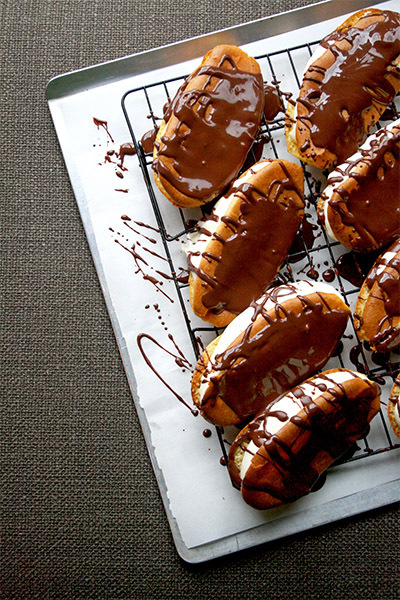 Those creative eclairs are simply stunning, the use of that choc drizzle heavenly and I so need these baking skills 😉 I love the Great Australian Bake Off too. We have such amazing hosts on the show. I get very inspired indeed! Nance, I love everything about this post! Your blunt honesty, your beautiful photographs, AND the cheater’s pastry cream! Genius recipe! I’m going to have to make a batch of that the next time I make cream puffs. Thanks so much for sharing! Your eclairs are fantastic! I love this book and their photos of the different eclairs looks incredible. But even your photos belong right alongside theirs….wow, Nancy! Your tempting me at this late hour. That chocolate drizzle…fabulous!